. . . . . . [CUBL311] Ralph de Montgomery m. ? [TMON301] William de Montgomerii (son of [VIKI371] Roger de Monte Gomerii, see VIKINGS), married Elizabeth de Tripon. [TMON311] Hugh de Montgomery married [HERB312] Sibell de Crepon (who was a sister of Gunora, and daughter [HERB301] Herbastus, see HERBASTUS DE CREPON). [TMON321] Roger I, Seigneur of Montgomery, and Vicomte of the Hiesmos, married [GIFF352] Josceline (niece of [HERB316] Gunora, DUCHESS OF NORMANDY, and daughter of [GIFF341] Osbern, see BRIMPSFIELD BARONY). Roger was exiled and went to Paris after his son William murdered Osbern de Crepon, see HEREFORD (FITZOSBERN) EARLDOM). Roger was living 1050. [TMON331] Roger II (born 1022, 3rd but 1st surviving son & heir) was Seigneur of Montgomery, and Vicomte of the Hiesmos in the pays of d'Auge. He married 1. (at Perche, 1048) [TALV322] Mabel (born at Alencon, 1026, daughter & heir of Count William, see BELLEME COUNTY, who was decapitated as she lay in bed at Bures, France, (2nd December 1079), by Hughes-de-la-Roche); then 2. Adelaide du Puiset (daughter of Count Everard of Breteuil). Roger accompanied DUKE WILLIAM II OF NORMANDY on his expedition against Domfort and Alencon (1048). He was with the DUKE whilst preparing for his Conquest of England (1066), though not present with him at the invasion, instead remaining in Normandy with the DUCHESS to govern the Duchy during William's absence. As his reward, Roger was created 1st Earl of Shrewsbury (1074). 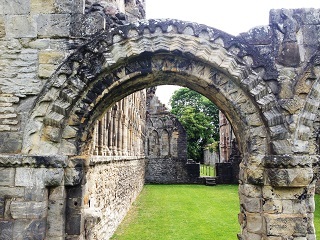 He refounded Wenlock Priory (1079-82), subject to Cluny Abbey (France), and in fact it wasn't until 1376 that the first English Prior was appointed. At the Domesday Survey (1086) he was tenant-in-chief of land in Cambs, Gloucs, Hants, Herts, Middlesex, Salop, Staffs, Surrey, Sussex, Warks, Wilts and Worcs. 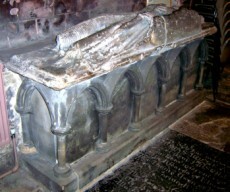 Roger died of an illness (July 1094) at Shrewsbury Abbey, and was buried there. About a 100 years later a slab was carved for his tomb. This slab, only, survived and is on display in the restored Parish Church of the Holy Cross. [TMOA341] Arnulf (youngest son of Roger & Mabel) was sent by his father to take over parts of Wales. He took Dyfed, then Cardigan and finally Pembroke, where he established the lordship there (1093). Back in England, he acquired the Lordship of Holderness (1096), and married (c.1100-02) [BORU352] Lafracoth O'Brien (daughter of King Muircertach, see O'BRIEN). He supported DUKE ROBERT OF NORMANDY in his claim to the English throne (1101), was found guilty and banished abroad (1102), possibly to Ireland considering his daughter Alice's subsequent marriage. He died c.1118-22. [TMOA352] Alice (born c.1105, daughter of Arnulf) married [OFFY351] Maurice Fitzgerald (see OFFALY LORDSHIP). [TMOR341] Roger (son of Roger & Mabel) married [MARC342] Almodis, 6th Countess of La Marche, (born c.1066, daughter of Adalbert, see LA MARCHE COUNTY). As Roger de Poitou, he was a tenant-in-chief of land in Essex, Lincs, Norfolk and Suffolk. Later Roger assumed the title of Lord of Bowland, and became 7th Count of La Marche (1091). Almodis died c.1116, and Roger c.1123. [TMOR352] Ponce (daughter of Roger de Poitou & Almodis) married [ANGO362] Wulgrin II taillefer (see ANGOULEME COUNTY). [TMOR353] Avice de Lancaster (daughter of Roger & Almodis) married (c.1112) [PEVE361] William Peverel the younger (see PEVEREL (2)). [TMON344] Maud (daughter of Earl Roger & Mabel) married (before 1066) [CONT321] Count Robert of Mortain/Mortagne (see MORTAGNE COUNTS). [TMON343] Sibyl (daughter of Earl Roger & Mabel) married 1. [FHAM341] Marcher Lord Robert (see HAMON); then 2. Sire Jean of Raimes. [TMON345] Hugh (born c.1056, son of Roger & Mabel), became 2nd Earl of Shrewsbury (1098). Whilst engaging a fleet of Norwegian ships off Anglesey, Hugh was riding along the shore when he was struck by either an arrow or javelin from a ship and fell dying into the sea (about 31st July 1098), unmarried, leaving no legitimate issue. The title therefore passed to his elder brother [TMON341] Robert (see later). [CUBL311] Ralph de Montgomery (illegitimate son of Hugh) is described under CUBLEY. [TMON341] Robert de Belleme (born c.1052-56, son of Roger & Mabel) married (before September 1087) [PONT352] Agnes (1st daughter & coheir of Count Guy, see PONTHIEU & MONTREUIL COUNTY). It was Agnes' father, Count Guy, who apprehended Harold of England (1064), handed him over to DUKE WILLIAM II OF NORMANDY, and thus paved the way for the Conquest. Robert became Count of Ponthieu, Alencon, Belleme and of the Hiesmos. He was Knighted at the Siege of Fresnay-le-Vicomte (1073), and became both 3rd Earl of Shrewsbury & 3rd Earl of Arundel (1098), succeeding his younger brother Hugh the 2nd Earl, who had been killed. Agnes was beaten cruelly by her husband Robert, who kept her shut up for a long time in his castle at Belleme. She escaped with the help of her faithful chamberlain, took refuge with Countess Adelaide of Blois (daughter of the late King William I), and retired to Ponthieu, whence she never returned to her husband. She probably died shortly after (October 1100). When King Henry I came to the throne (1100) there became a power struggle between Henry and his older brother DUKE ROBERT OF NORMANDY. Robert de Belleme, and his younger brother Arnulf, sided with DUKE ROBERT in rebellion against Henry (1101). Robert built a strong castle on the of of a hill at Bridgnorth in preparation for the uprising against Henry. The rebellion failed, leading to the Treaty of Alton in which DUKE ROBERT acknowledged his younger brother Henry to be king. 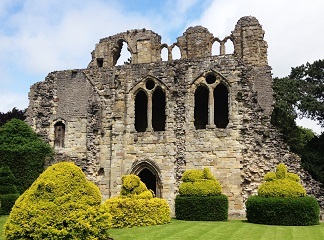 Robert de Belleme refused to respond to the 45 charges of treason etc against him, and so the king stripped him of his titles, and captured his castles at Arundel, Bridgnorth, Shrewsbury and Tickhill, forcing the Earl into exile (1102). Both the Arundel and Shrewsbury titles then became dormant. Robert took a leading part in the plot to restore Normandy to DUKE ROBERT OF NORMANDY's son William Clito (1111). Robert rebelled and aided Count Fulk V of Anjou (father of DUKE GEOFFREY V OF NORMANDY) against King Henry I (1112). Later that year King Louis VI of France sent him as ambassador to Henry, to demand the release of DUKE ROBERT, but Henry seized him instead. Robert was tried at Bonneville-sur-Torque on various charges (14th November 1112), and was condemned in the King's Court to the most rigorous imprisonment. He was confined at Cherbourg, and all his honours, lands and castles were forfeited. Henry took him to England (July 1113), where he was imprisoned at Wareham Castle, Dorset, where he remained to his death there (1130). [TMON352] Rissa (daughter of Robert) married [BERK381] Lord Roger (see BERKELEY BARONY). [PON1351] William Talvas (only son & heir of Robert) is dealt with under PONTHIEU & MONTREUIL COUNTY.